Because the Volkswagen Beetle engine is air-cooled, the air delivery system is vital to maintaining the proper running temperature of the car. This makes the fuel to air mixture, regulated by the carburetor, an integral part, not only to fuel efficiency and engine power, but to the overall health and performance of the engine. 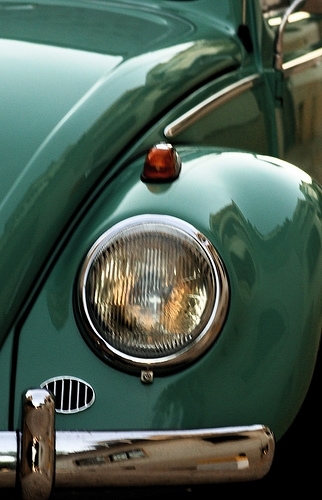 The carburetor on a standard VW Beetle engine is located almost directly in the center of the visible part of the engine when the deck lid is opened. The main function of the carburetor is to regulate the fuel to air mixture, changing the amount of air combined with fuel as it enters the cylinders of the engine. This regulation, by changing the chemical composition of the fuel mixture in the engine, also changes the rate at which the fuel explodes (combustion) and burns, which in turn changes how much pressure is placed on the cylinders and, therefore, how fast they push outward and inward. 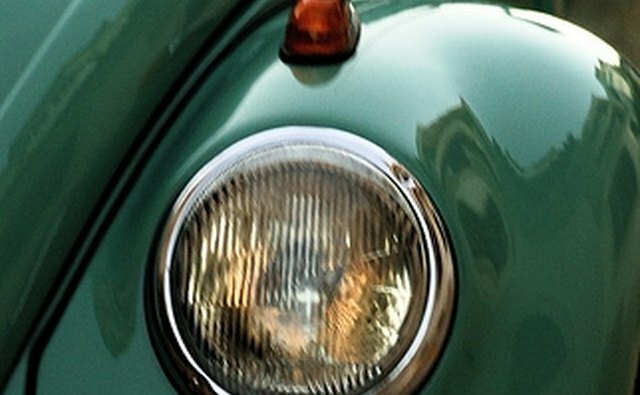 Problems with a VW Bug carburetor are among the easiest to recognize. Any problem with the carburetor will immediately change the way the car runs. It will often also change the way the engine sounds and the way the engine exhaust looks or smells. Often, however, the carburetor is not malfunctioning, but needs to be adjusted. Adjusting a VW carburetor is straightforward: you need either a carburetor adjustment tool, which resembles a very narrow-bladed screwdriver, or a very narrow-bladed screwdriver. The carburetor adjustment screw is in the center of the carburetor. Turning this screw to the right or left raises or lowers the amount of air mixed with the fuel in the engine. Carburetor adjustments should be done with the engine running. Turn on the engine, set the parking brake, and shift the car into neutral to allow it to continue running without the clutch depressed. Open the deck lid, and turn the carburetor adjustment screw to the right or left. Due to variations in engines and wear and tear, there is no definite answer as to which direction will accomplish the needed adjustment. While you are turning the adjustment screw very slowly, listen to the engine and observe the exhaust. The engine should run smoothly without any obvious popping sounds or uneven idling and should not sound like the gas pedal is being pressed. VW Bug engines are slightly loud, so turning the screw until the engine is quieter may lower the air to fuel mixture too far. However, if your Beetle is roaring, you may need to tone the mixture down until it reaches a more reasonable noise level. The exhaust should be clear and you should not be able to smell gasoline or any burning smell. The presence of an identifiable fuel odor means that you have turned the mixture down too far and the fuel is not being used before it reaches the exhaust. The presence of a burning smell indicates fuel is burning too fast and you have turned the mixture up too far. If you cannot achieve the right air to fuel balance through adjusting your carburetor or you notice the carburetor leaking anywhere, you may need to replace it. Replacement Beetle carburetors are available through specialty Beetle parts replacement houses and online. Many auto parts stores will also carry basic engine parts for Beetles such as alternators and carburetors. Be sure that your replacement carburetor is the correct one for your engine size and model year. If you are replacing a stock carburetor, check for the OEM (Original Engine Manufacture) label, which will ensure that your replacement carburetor matches as closely as possible the specs of the original. The carburetor, along with many other vital engine parts, is relatively simple to replace. You will need a set of metric wrenches--all VW Beetle parts are measured in centimeters. The process of replacing the carburetor is straightforward: remove all the connections, clean the mounting posts of any remaining seal material, place the new seals, mount the new carburetor, bolt it down and replace all the connections. Once the new carburetor is in place, start the engine and check for fuel leaks. Follow the earlier adjustment instructions to fine-tune the mixture and your Beetle is once more ready to go.